What's Missing On Your Credit Report? I’m generally in the spirit of full disclosure here, so when discussing credit reports, I’ll start with my own. My husband and I have one late payment on a credit card. It’s an ugly, glaring mark that makes me cringe every time I pull up my credit report. It also marks the month right after we got married. You see, we merged all of our accounts the previous month, but we never actually discussed who would be responsible for paying bills. Oops. We had a lot to learn, apparently. Ryan Guina, a veteran who runs both TheMilitaryWallet and CashMoneyLife, however, shared some information with MilitaryByOwner on how I may be able to get that little hiccup removed from my report. Wish me luck, and then read on to see some of the great information that Guina shared on how credit reports can affect prospective military homebuyers. Are You Planning to Buy a Home at Your Next Duty Station? If you’re considering buying a home at your next duty station, whether that’s one, two, three, or even five years (I’m talking to you, Coast Guard families! ), then before you begin getting your hopes up with a home buying wish list, you’ll first need to check what’s missing on your credit report. To know what’s missing, you’ll need to first understand what your credit report is, and then understand how your credit score is determined. Your credit score plays a huge role in determining whether you will qualify for home financing, and fortunately for military families who use a VA Home Loan to finance their purchase, that credit score requirement is typically much lower than a score requirement for a traditional, or conventional, mortgage. Your credit report as a whole, however, plays an even bigger role than just your objective credit score. Any serious glitches on your credit reports that reveal negative financial trends or glaring gaps in financial literacy could potentially disqualify you from getting financing for your home at all. Learning how to understand your credit report from the perspective of your future potential lender, however, could help you achieve your home financing dreams. What Should Your Credit Report Contain? Your credit accounts, to include your bank card, auto loan, mortgage, etc. Unfortunately, as we’ll look at later, as many as one quarter of all credit reports also reveal information they shouldn’t. This kind of information could potentially prevent you from moving into your dream home. Don’t be surprised if you find an error on your credit report. Guina shares that “estimates show that between 20-25% of credit reports contain some form of error.” Taking care of errors by calling each creditor in turn to dispute the error can help quickly improve your score. Guina explains that making on time payments can improve your credit score, but if you do have a missed or late payment, then you can ask your creditor to waive a one time missed or late payment. “Many lenders,” Guina says, “...will do this for your first missed payment.” Though it may seem a little intimidating to ask, know that your creditor can only say no. Having a history of making on time payments can really help if you do have one glitch on your credit report. Everyone makes mistakes. Playing around with the numbers can help boost your credit score quickly, but it's a less than ideal option. Given two people with the same amount of credit card debt and otherwise same financial scenario (same income, same amount of debts), one may qualify for a home and the other may not. Guina gives the example of a person with an $8,000 credit card balance on a $10,000 credit card limit. That amount shows an 80% credit utilization rate, which is much higher than lenders want to see. If you decrease that utilization rate by either paying down the balance, for example, to a rate below a 30% usage or spread the debt across other credit cards (a less ideal option) to reduce the utilization per card, then you can quickly improve your credit score. 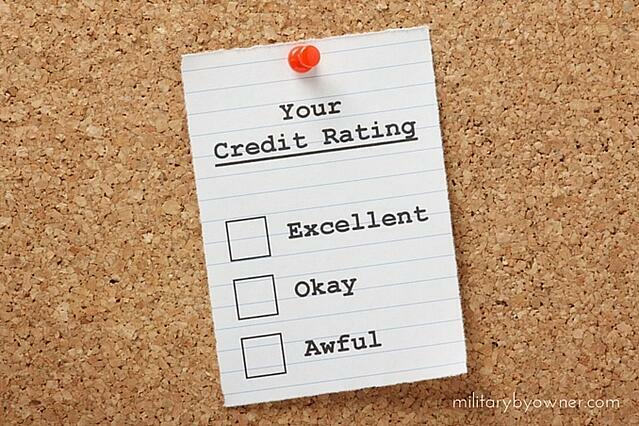 A Less Known Way to Improve Your Credit Score! When you’ve taken care of your credit report, then it’s time to plan your next house purchase. Check out our recent article 5 Steps to Balance Your Home Buying Dream against Your Budget to help you get started! Looking for more information on VA Home Loans? Click below!